Kalamazoo KG11 1936 (vbg #1307) | $1975 | Gibson's Kalamazoo line was created to help the company weather the depression. 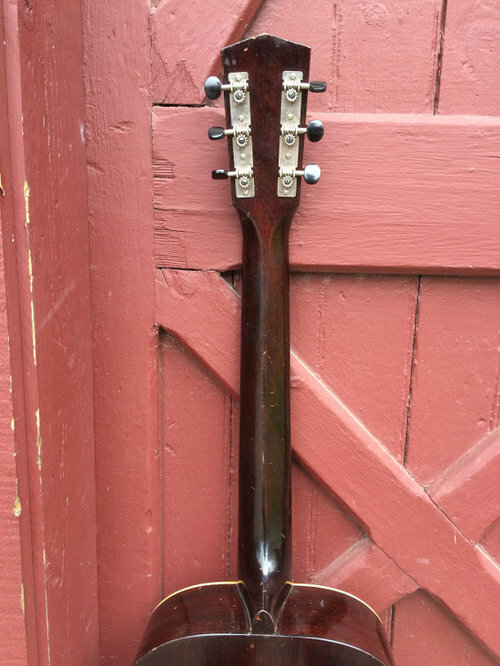 The Kalamazoo flat tops lacked a truss rod, and were ladder braced, allowing for a less expensive guitar. The Gibson name was left off to avoid cheapening the Gibson brand. That said, the Kalamazoo line of guitars was produced with the same fine materials and craftsmanship as the regular Gibson line. The B-stamp FON dates this guitar to 1936, and it remains in pristine, original condition. But for a recent neck reset and refret, no part is changed, lost or altered .. 100% original including the soft case. Only a few nicks and dings keep this from 'mint'. The guitar is set up to play comfortably and produces the KG11 tone, woody and round, and a cut above most of the KG11s we've had.